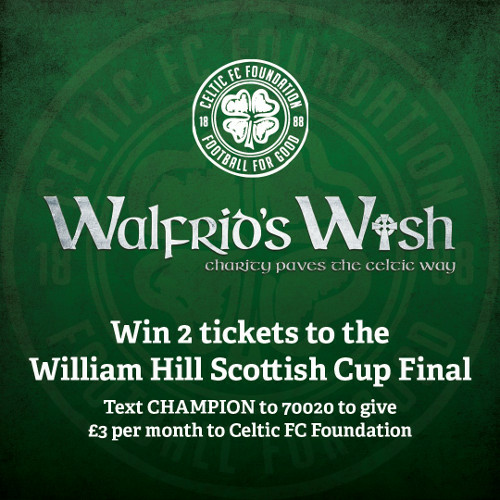 WE are delighted to announce that current supporters of Celtic FC Foundation’s Walfrid’s Wish campaign, along with those who sign up to the monthly giving scheme by 3pm on Thursday, May 17, will be entered into a prize draw to win two tickets to the Scottish Cup final at Hampden on Saturday, May 19. This year’s final will see Celtic take on Motherwell and aiming for a historic domestic double treble, and two lucky supporters will join the Celtic faithful to witness the highly-anticipated match. Via the Walfrid’s Wish monthly giving scheme, supporters are invited to contribute £3 or more per month to the advancement of the work of Celtic FC Foundation. The winner will be contacted on Thursday afternoon, with tickets available to pick up from Celtic Park before 5pm on Friday, May 18. * Competition open to adults 18+. You will be charged £3 plus a message at your standard network rate in the first month and £3 per month thereafter. To unsubscribe at any time, text STOP to 70020. Celtic FC Foundation will receive 100% of the donation. Please see below for full terms and conditions.